Japanese restaurants are very popular in Indonesia. There are many types of them as Japanese cuisine is wide-ranging, diverse, and rich. Sushi restaurant is one of the examples. We can see a lot of them in big cities of Indonesia. An itamae (sushi chef) once said that the key of perfect sushi is quality of the ingredients. That is what makes end product appealing to customers. However, for us, the key for perfect sushi is the chefs as they are the masterminds of a Japanese kitchen. Itamae refers to a cook or chef in a Japanese restaurant, especially sushi restaurant. It literally means “in front of the board” as they work with their cutting board. Traditionally, there is no formal school for the cook. They obtain their skill with hard apprenticeship and on-the-job training for long years, ranged from eight to twenty years. The first step of sushi apprenticeship is called oimawashi. This step is a fundamental of Japanese chef as it shapes the apprentice’s characteristics, manners, and the most important, identity. In the first years, main responsibility of an oimawashi is cleaning duty. Cleaning, dusting, even sweeping and mopping the floor are parts of their daily routines. A sushi chef has to maintain his cleanliness as it is the most important part of this job. There is no room for complaining as the loyalty of an oimawashi is also tested. When they are ready, they will be given simple duties. It varies from hanging or closing the noren (curtain) to show that the restaurant is opened or closed, cutting vegetables, making pickles, preparing warm clothes for customers to wash their hands, to brewing hot tea for welcoming the diners. Years after, an oimawashi will be given his first important duty of sushi making, preparing sushi rice. An itamae is very proud of his rice. It is prepared from special rice and seasoned vinegar. The rice is blended and fanned using a particular bamboo that keeps the texture and moisture in right balance. The next step of apprenticeship is wakiita. Wakiita literally means “next the chopping board”. In this step, a wakiita is allowed to handle fresh ingredients. For the first, they grate gingers to neutralize the stink of strong-smelled fish like mackerel and prepare wasabi. 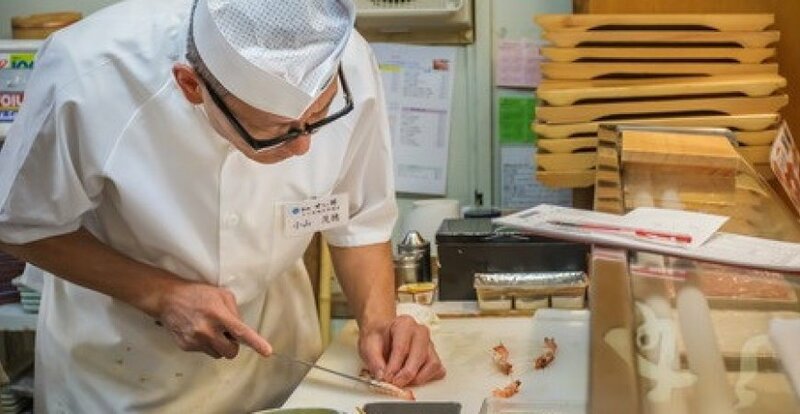 After that, they hold bigger responsibility such as cutting and scaling the fish, cleaning the shrimp, massaging the octopus, and even making sushi rolls for take-out customers. Wakiita is also taught to cook egg, deep-fry tempura (ageba), grill meat and fish (yakiba), and if a wakiita is already mastering them all, he is taught to cook stew and other menu (nikata). Nikata requires deep knowledge about the menu so that it takes long years of learning. The highest appreciation for a wakiita is an allowance to use hocho or chef’s knives. Made from carbon steel with high quality, the knives demand great respect. If a wakiita is approved to use a hocho, it is a sign that he is already trusted by the chef. After some years, finally a wakiita can be approved as an itamae. He is already mastered the art of making sushi, even can create recipe for a restaurant. His duty is no longer making sushi alone. An itamae is also responsible for financing the restaurant and socializing with the customer. In the end, being an itamae is not just about being a head of a restaurant. He is also the heart as he keeps his restaurant alive and enliven.